Hand of a Superhero_3d Printing Latest News_Shenzhen Affinity 3D Printers Intelligence Technology Co., Ltd. 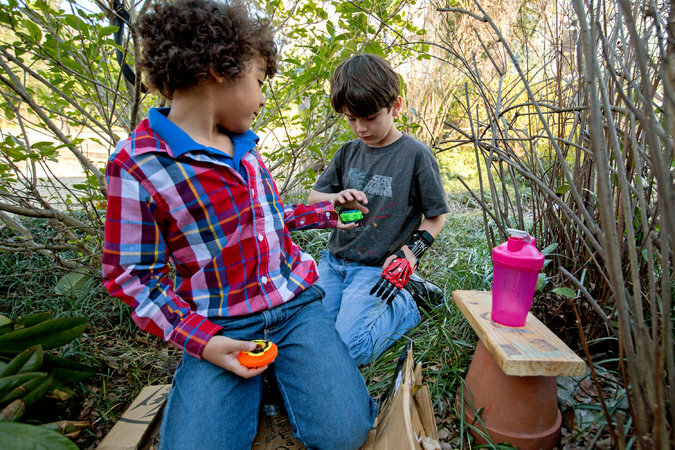 The Rivermans, of Forest Grove, Ore., could not afford a high-tech prosthetic hand for their son, and in any event they are rarely made for children. Then help arrived in the guise of a stranger with a three-dimensional printer. He made a prosthetic hand for Dawson, in cobalt blue and black, and it did not cost his family a thing. Now the 13-year-old can ride a bike and hold a baseball bat. 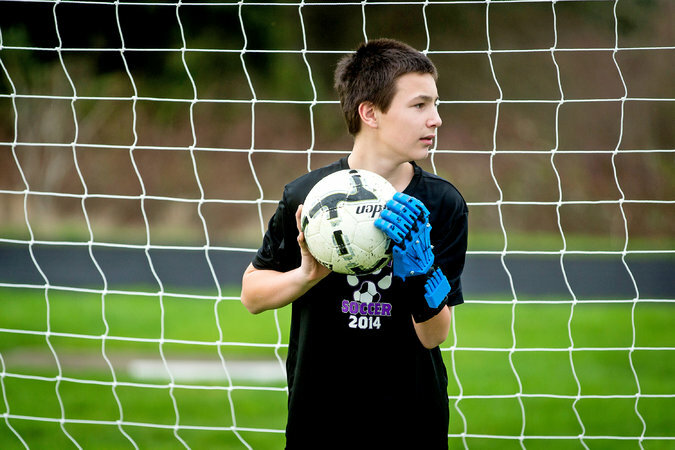 He hopes to play goalkeeper on his soccer team. “He’s realizing he can do things with two hands and not have to try to figure out how do them,” said his mother, Dawn Riverman. The proliferation of 3-D printers has had an unexpected benefit: The devices, it turns out, are perfect for creating cheap prosthetics. Surprising numbers of children need them: One in 1,000 infants is born with missing fingers, and others lose fingers and hands to injury. Each year, about 450 children receive amputations as a result of lawn mower accidents, according to a study in Pedatrics. 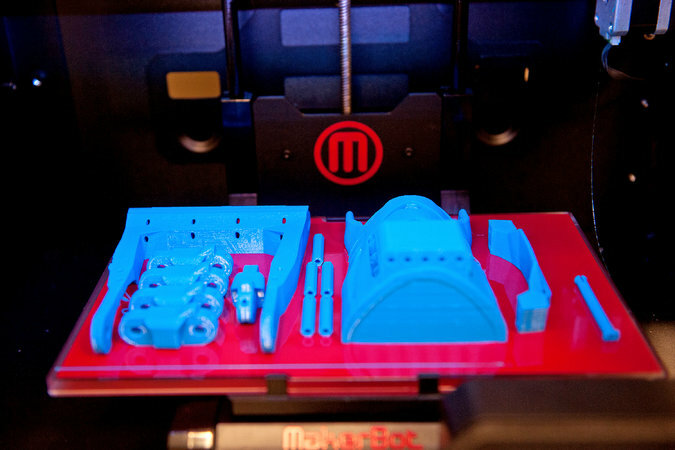 The 3-D-printer-generated hands, like a design from Johns Hopkins, are easy to assemble. E-nable, an online volunteer organization, aims to change that. 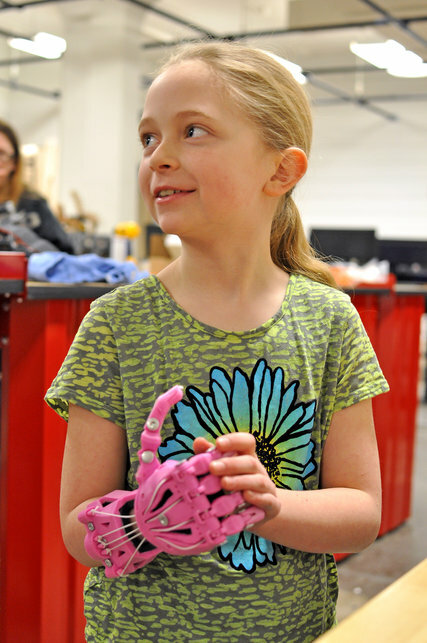 Founded in 2013 by Jon Schull, the group matches children like Dawson in need of prosthetic hands and fingers with volunteers able to make them on 3-D printers. Designs may be downloaded into the machines at no charge, and members who create new models share their software plans freely with others. They are not designed to look like replacement parts. One popular model, the Cyborg Beast, looks like a limb from a Transformer. The Raptor Hand and Talon Hand 2.X do not suggest disability; they hint at comic-book superpowers. And they are not made to be hidden — indeed, they can be fabricated in a variety of eye-catching fluorescent colors, or even made to glow in the dark. 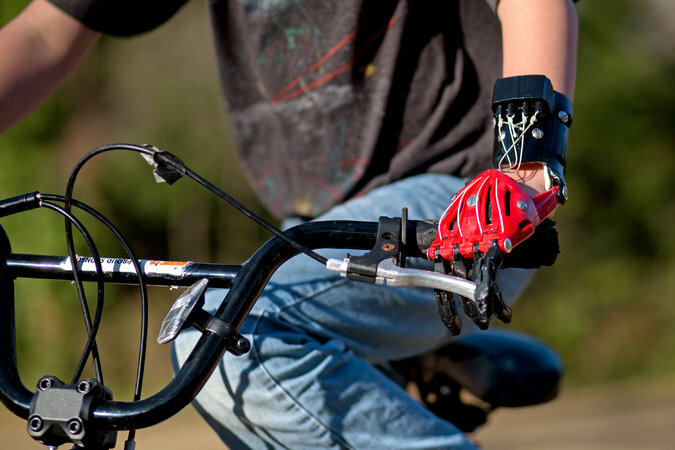 Ben Stephens helped build his printer-generated hand and then strapped it on. The fingers are closed by flexing the wrist, which pulls on cable "tendons." Move the wrist again, and the hand opens. The hands are printed in pieces, which are assembled by volunteers, or by parents and children themselves. More than 50 groups, such as Boy Scout and Girl Scout troops and schools like Convent of the Sacred Heart in Manhattan, have created hands for about 500 children. 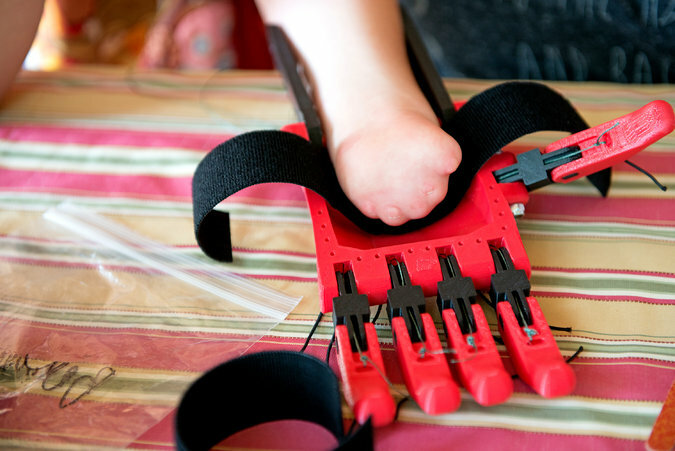 An online tool on the E-nable website, the “Handomatic,” is used to fit the prosthesis to the child. A parent enters a series of measurements, and the tool spits out a custom design for the child that can be downloaded into the printer. Each hand takes about 20 hours to print and another two or three hours to assemble. (Designs also can be downloaded from Thingiverse, a website run by MakerBot, a manufacturer of 3-D printers.) Assembly tutorials are available on YouTube. A former school supplies salesman and special effects artist, Mr. Owen in December 2011 shared a video on YouTube of a giant puppet hand that he had made. That video was seen by Richard Van As, a carpenter in South Africa who had cut off some of his fingers with a table saw. He asked Mr. Owen to help devise a prosthesis, and over two years, the pair came up with a workable design. A 3-D printer, they figured, would make the prosthesis cheap and easy to produce. When Mr. Van As learned of a boy in South Africa who also needed a prosthetic hand, they made one for him, too. The idea caught on. These days, some leading experts in 3-D design are now collaborating with E-nable on improved prostheses for children. The hands are lightweight, less than a pound, but the fingers move together, not separately. And they do not work for every child: Those with midarm amputations, for instance, usually must been seen by a professional prosthetist. More often, though, the children are like Ethan Brown, 8, who was born with two fingers missing on his left hand. Now he wears a Cyborg Beast in black and red, his school colors.